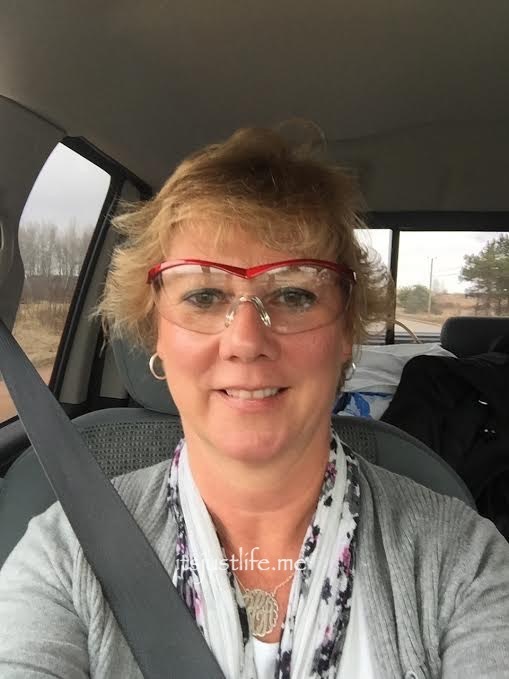 The week has been filled with adventure and a lot of” seats in the seats of the truck time” as I am accompanying the husband on an across the midwest business trip. I am, as my friend Ann observed, a roadie of sorts. I am driving the behemoth of a truck. I am navigating and getting the man to the places he needs to go while he takes calls, sends emails and texts and does business on the road. I have made many observations along the way. First of all —all vehicles should have some kind of gear shift of some kind. A rotary knob is just wrong. I don’t care what you say. I just can not get used to this. I fit right in at the Kwik Trip. We had to do a flying eat on the road thing because we had a lot of miles to cover and not a lot of time to cover them before the next appointment. I went in to “gather” as Chris filled up the gas tank. It was a cornecopia of food selections and there were a lot of men milling around. I had my eye on the hot dogs rolling on the cooking rollers or whatever you call them but I couldn’t figure out how the heck you got them off and where were the buns? You can’t just grab a hot dog and eat it bunless, can you? I told a man standing there that it was overwhelming and he looked at me like I had 5 heads so I moved on to the prepared sandwich area where a kind lady helped me decide on a sandwich and chicken tenders. 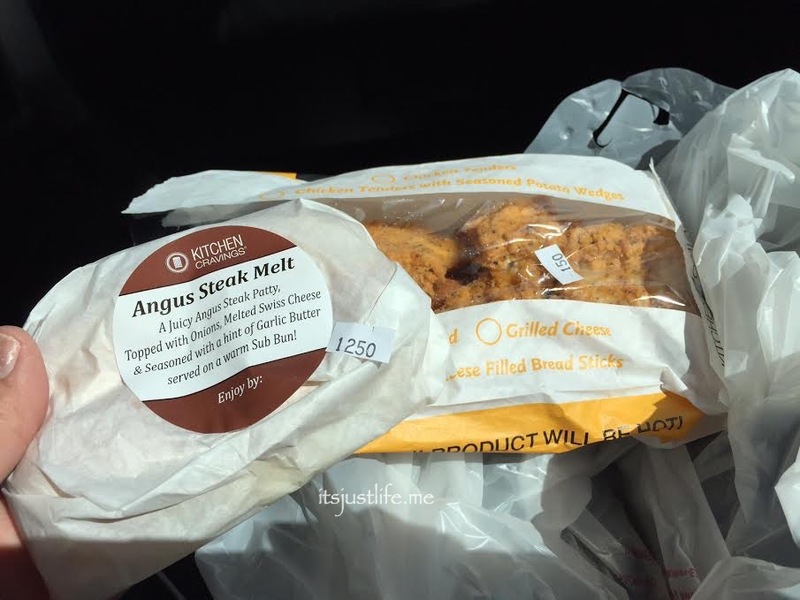 I don’t think I am cut out for gas station food. 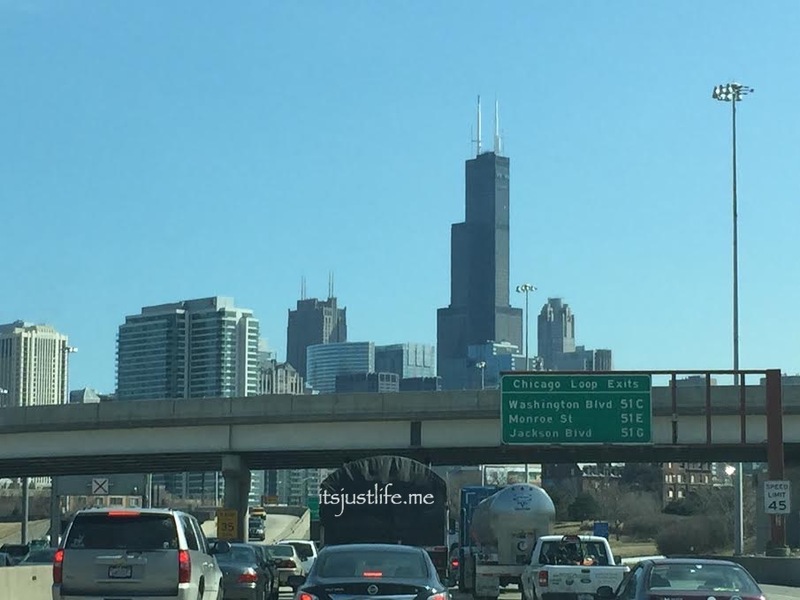 We said hi to Chicago and spent what seemed like an eternity trying to get through the city. Chris LOVES the Skyway so we took it even though my GPS was saying no. I was glad he was driving. It was stressful. How many years have we been driving through Chicago and it is ALWAYS torn up. Always. Not to mention the millions of trucks. I think every truck in the USA was on the road in Chicago. I am going to be returning to Chicago in a little over a month but more on that later. It is going to be EPIC. That is all I can say at this point but trust me on that one. We were less than enamored with the toll booths in Indiana. Seems like Indiana is on everyone’s hate list right now but our pet peeve with them was their blasted toll booths. We both have the I-Pass things in our personal cars which makes our driving to Ohio trips a piece of cake but in this rental truck we had to go to the cash/credit lanes. The Indiana ones were unmanned booths and the machines were hinky. Chris was losing his mind trying to get them to work. Let’s just say we were glad to get out of Indiana. I have been able to go into some of the businesses with Chris on this trip and meet some folks, tour some plants and generally see him in action which is pretty darn cool. One place that I did not go in other than to avail myself to their facilities (it’s a long trip) boasted a new state of the art building with security out the wazoo. 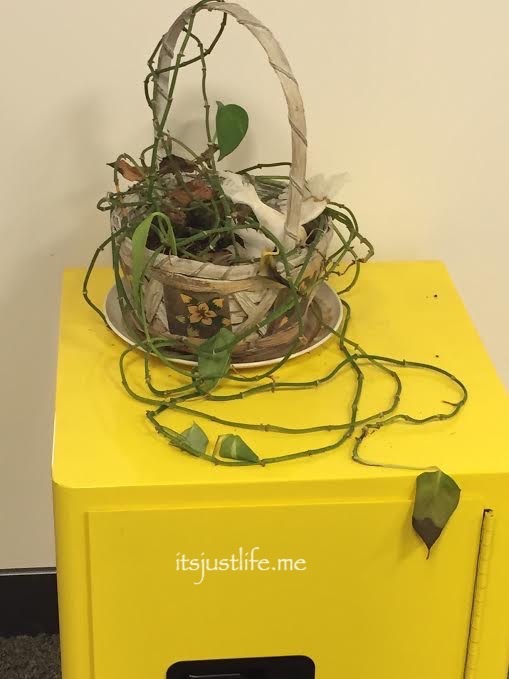 Unfortunately no one was looking out for the welfare of this poor little plant. Seriously folks—throw it out! 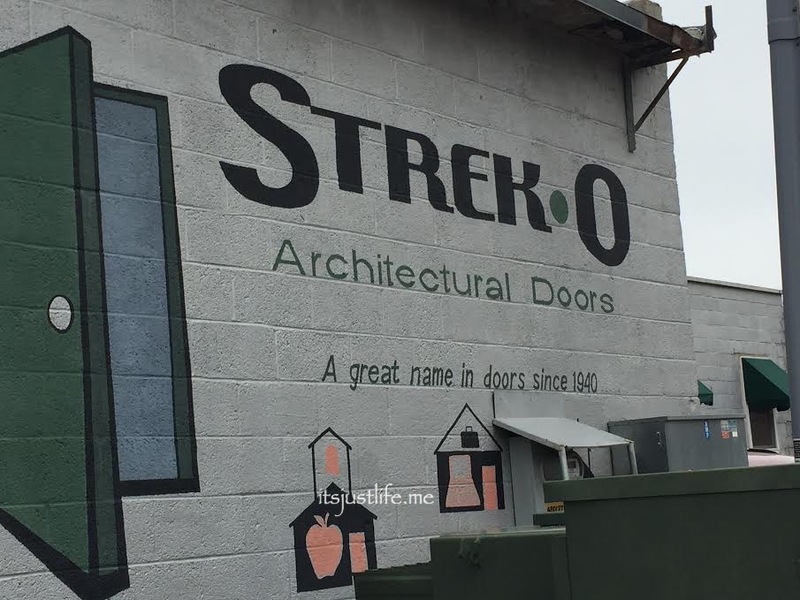 One plant that I was able to go into was the Strek-O facility in Abbottsville, Wisconsin. We met with Al Deiler who gave us the grand tour and shared the story and vision of the company with us. It is always fun for me to go into a factory to see how things all work together. Chris’s roots are deep when it comes to his love of factories and helping them become more efficient and I appreciate his skill and love to watch him take it all in. Plus the smell of wood—yum. 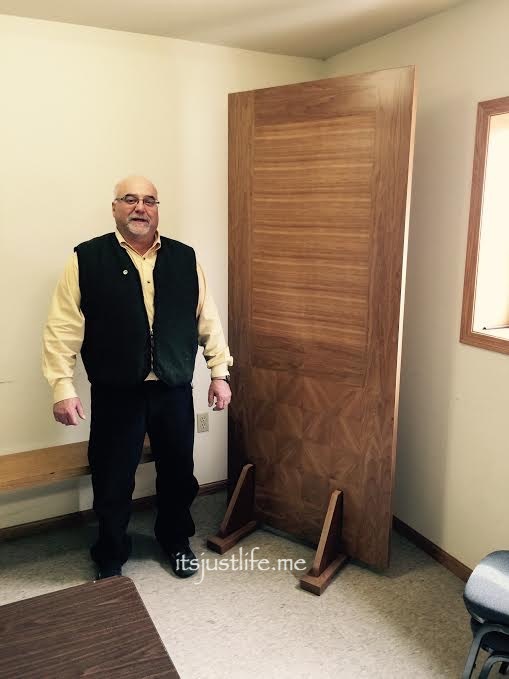 Strek-O does some amazing door designs and we even got Al to pose with one that is simply beautifully crafted. Wouldn’t you love to have something like this in your home or place of business? Al told us that they had a high school art class do the mural one summer and it was quite a project. 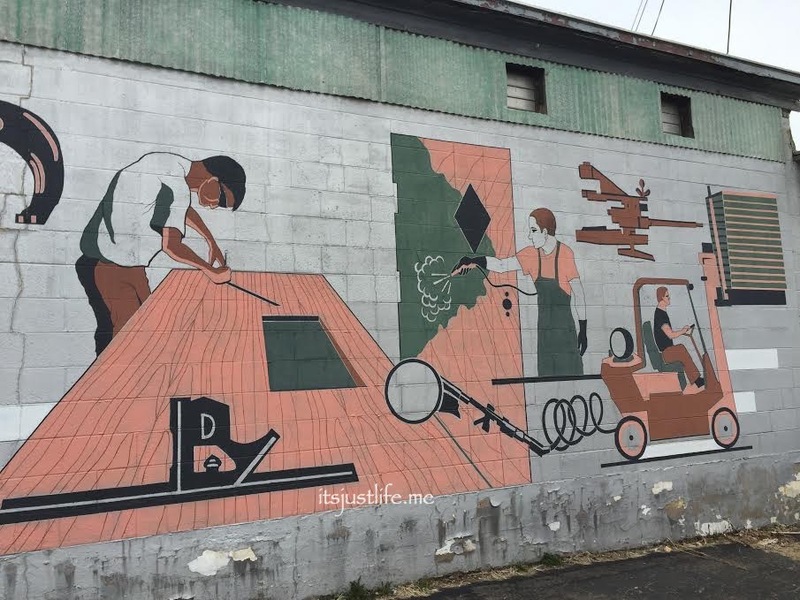 Apparently productivity went down for awhile in the plant because the mural was painted by a number of girls wearing short shorts. Yep, you got the picture, right? Of course safety is always first in places like this and I love that the pair of safety glasses I got were my favorite color. It has been a great week so far and I am having a blast spending time with the hubby this way. By the end of the week we will be with my mom and our boys so that is a pretty fabulous way to end the week and spend Easter, isn’t it? Have you ever gone on a business trip with your spouse or loved one? How did it work out for you? Sounds like you’re having quite an interesting time! The “business trips” I’ve been on with my hubby have usually involved racing: either cars or boats. But I know what you mean about grabbing food, a restroom break and a gas fill-up all in one stop. Even now, hubby will sell an engine as we’re driving down the highway. I’m usually writing down the price he’s quoted, and texting VIN numbers, etc. It’s great to be making money while you’re riding down the highway. Hey, Al “stole” our saying here in Smithfield THE Ham Capital of the World: we use everything but the squeal!! I love “going on the road” with T, however ours involves a lot more gravel roads and pulling large pieces of equipment from field to field typically and not near as far as yours…just across the county and if we’re lucky we’ll get to travel to an adjoining county, but….I love being with him and watching him work and be in his element! Enjoy your time! Hugs! Thanks, Katy! It is definitely a different kind of road trip but fun all the same, right? I think watching them work is amazing . Thank for stopping by! Can’t wait to hear about EPIC times in Chicago… That mural is awesome! Your comment about that plant made me laugh. I would love and have hoped to accompany Pig-farmer on a few of his business trips after I left my paying job, but the livestock has kept me home! Maybe this summer … I bet I can get one of the boys to oversee the farm. I hope! That is what all my farmer friends say—it is very difficult to get away because you have critters to care for! No one takes care of them like you do, right? I get it. Hopefully you will have some adventures of your own! Thanks for stopping by. I have been horrible at visiting blogs. Trying to catch up! I tried to work as my husband’s assistant once for a Saturday morning. Epic fail. And this week, on a home project, he asked me to bend hooks into six pieces of wire. Couldn’t do it. The man is talented in a way that I definitely am not. Safe travels, my friend, and have a fabulous Easter with your family. This is a cool post Beth Ann. Love the mural and the door is beautiful… bet you didn’t know that I have a thing for beautiful wood doors. My next house is going to have a beautiful big old wood door… 🙂 I used to drive a behemoth truck to haul horses… I loved it, I could see ALL! It’s not easy being 5 feet 4! Glad you are heading for family time.. take care! You and I have the same issue with our shortness even though I don’t think I rally am all that short. I am getting used to the truck actually and since I used to drive one of those big conversion vans back in the day it isn’t all that much different. It has been a really fun trip and yes—the family time will be amazing. I am so glad ;you are having a good time and be careful that it stays that way. I am looking forward to seeing you. that door is gorgeous! wow. I’d love that on my house. what an adventure you must be having. I talked to it but I think it was beyond help. Adventures of Beth Ann! I’ve sort of been on a business trip. Mr. Gibber an I had to drive to Michigan from Ont. look at a helicopter we were looking at buying (We actually did end up buying). The trip there was good. When we got there the pilot/broker took us up for a flight in the helicopter. It made me motion sick. After the negotiations started and it didn’t take long to discover that the broker was very corrupt. It was a very long and hard process but in the end, we owned the helicopter and we leased it out to the school where Mr. Gibber was training as a helicopter pilot. Talk about a lot of learning curves! Sorry this is so long. Oh man— that sounds like a huge adventure! Thanks for sharing! Hey I waved and said hi to you today when we were in Michigan—– did you hear or see me? I waved to Canada— we were at the border! Sounds like you’re having a great time with hubby; so glad you were able to do that this week. 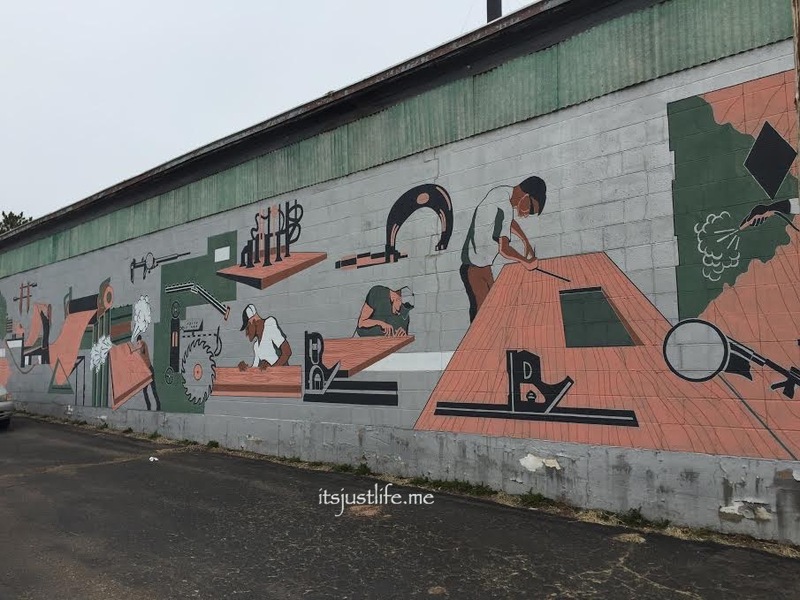 That mural is a beautiful piece of work, by the way…should have know a group of gals did it!! Hubby and I both have take several business trips together several years ago before we retired. The best trips were to Palm Springs, CA. I do so remember he was in classes all week and I got to spend time by the pool! FYI – if you think driving that truck is somewhat of a struggle, try driving a 40′ motorhome! Lots of fun! Enjoy the rest of your week!! We have talked the motorhome thing but I am not convinced on that yet. The truck isn’t that bad to drive actually but it was just such a change from what we had intended to be driving. The family time has begun now so the road trip is behind me. Yay! I enjoyed this post, Beth Ann. To me, living on a small island, a trip like yours sounds very exotic. I’ve only visited the US once and I loved it. You give a real flavour of what a road trip is like. Before he retired I accompanied my husband to a couple of weddings he carried out. He was a registrar of births, deaths and marriages so carried out civil (i.e. non-religious) marriage ceremonies. I loved watching him do these – he was very good at it. People come from all over the world to get married on Skye for some reason, so I also enjoyed finding out why the ‘off-islanders’ had come here for their weddings. Love your travels! Be safe and have a wonderful Easter with family. That is a great mural. 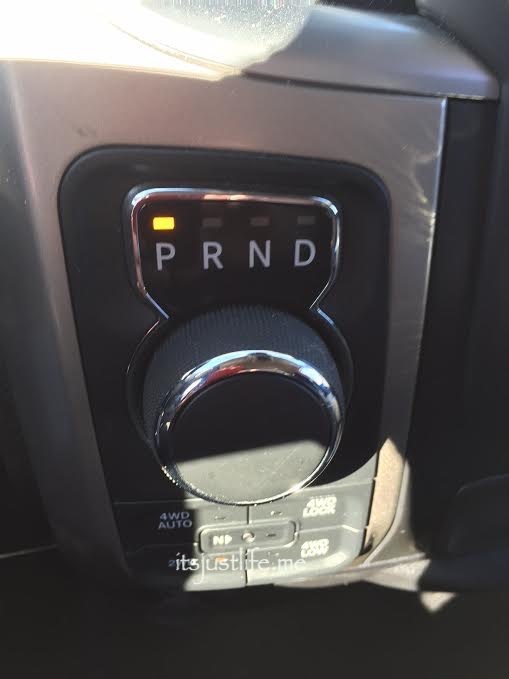 Before you know it, you’ll be trying to turn the shifter knob–that isn’t there–in your car. It’s amazing how quickly we adapt to something new like that. That is true! That knob was odd to me so I am glad my car does not have one! Sounds like a great trip. Sorry I´m so late but I was “on the road” too. Always fun to go on the road with hubby. Wish you posted a picture of you driving the truck. I should have gotten that picture of me driving but I did not get Chris to take one this time. It was a fun trip but exhausting. When hubby & I were a fairly new couple I went on a business trip with him to a couple of conventions, one in Brandon, MB & the other in Thunder Bay, ON. It was very interesting to see all the booths set up & meet the many people who wandered by our booth (hubby’s vehicle all decked out with emergency lights, etc. since that was his business). After listening to hubby explain the benefits of certain items, I was even able to help out with attendees when hubby got busy with someone else. By the end of the convention I was selling right alongside hubby! That is awesome! I think I have a lot to learn before I can sell their products. Great to see you here!